How Do I Choose the Best Dresser Drawers? Slotted drawers help improve organization. 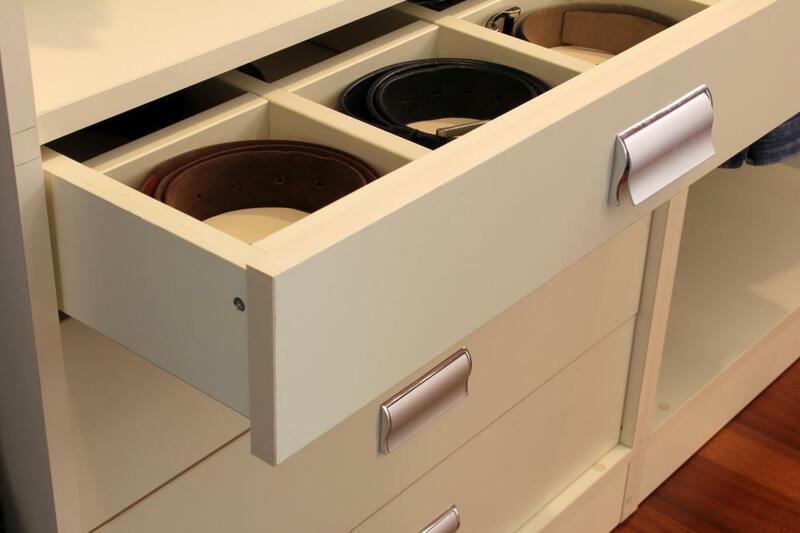 There are many factors involved when you are trying to choose the best dresser drawers. You may, for example, consider the depth and width of the drawers as well as the amount of space the dresser will take up in the room. You may also do well to select drawers that have solid, sturdy construction. Additionally, visiting a store and purchasing dresser drawers based on hands-on testing may prove to be the best option; the best dresser drawers typically have strong handles and slide smoothly, without sticking. The size of the drawers is important when you are trying to choose the best dresser drawers. If you are planning to place lighter, smaller items, such as lingerie and socks, inside a dresser, you can likely opt for drawers that are a bit more shallow. To store sweaters and jeans, however, you will need deeper, wider drawers. The measurements of the drawers you choose also depend on the amount of clothing you plan to store in your dresser; the more clothing you have to store, the more depth and width you will need. The best dresser drawers have solid construction and feature sturdy materials as well. Dressers take a lot of punishment day in and day out, as people open and close their drawers multiple times each day. As such, it makes sense to choose the sturdiest you can afford. Keep in mind, however, that it is also important to consider the construction of the dresser frame and base rather than focusing on the drawers alone. You may also consider the construction of a dresser based on where you will use it. If you plan to place it in a guest room and only use it occasionally, you may not need top-of-the-line construction. If you will use it every day, solid construction is more of a must. It also may be important to consider the ease with which you can use dresser drawers when making your selection. You may do best with drawer handles that are easy to grasp and firmly secured to the drawer. You might also prefer drawers that slide smoothly and are unlikely to get stuck; drawers that stick and become derailed are a frequent complaint you can avoid by testing them before you buy. When you are trying to choose the best dresser drawers, it is also important to consider the amount of space the dresser will take up in your home. For example, you may do well to measure the space in which you will position the dresser and make sure you will have enough room to open the drawers without hitting or blocking anything. Some people recommend choosing a dresser in a size that will still allow you to have at least 18 to 24 inches (about 45.72 to 60.96 centimeters) of walking space around it. How Do I Choose the Best Mission Dresser? How Do I Choose the Best Triple Dresser? How Do I Choose the Best Corner Dresser? How Do I Choose the Best Mirrored Dresser? How do I Choose the Best Cherry Wood Dresser?